Download all 10 of our pre-written teen behavior contracts along with our simple and effective teen discipline program. As a bonus we also offer a unique set of parenting tools specifically designed for parents of teens. There's no need to rack your brain trying to create your own teen driving contract...we've already done the hard work for you! 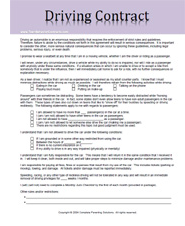 Use this contract to establish clear expectations for your teen with regards to his or her driving. This contract addresses such topics as: driving responsibilities, use of seatbelt, tickets/infractions, passengers, distractions, and more! 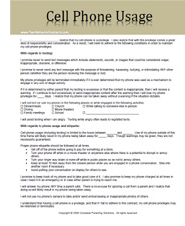 This teen driving contract is a must-have if you are the parent of a teen that is beginning to drive. It's best to set the ground rules early on so that your teen develops safe driving habits...and our teen driving contract will help you do that! The new social media craze has made it difficult for parents of teens to know just what their child is doing on these sites and exactly who they are talking to. Our online behavior contract helps to alleviate some of the headaches associated with such activities. 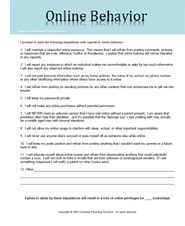 Our Online Behavior Contract covers such topics as: content of messages, passwords, privacy, bullying, and more. Teaching your teen proper online etiquette is essential in the information age, especially when it comes to social media sites and email...and our online behavior contract will help you do that! Unfortunately, there are always going to be teens that dabble and experiment with substances that they should not be dabbling or experimenting with. Parents can't always be there to steer their teens away from such influences...they can, however, address the issue through the use of our pre-written substance use contract for teens. 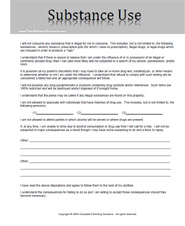 Our substance use contract addresses such topics as: what is allowed and what is not with regards to specific substances, parties, paraphernalia, and more. Cell phone usage among teens is about as popular as swimming is for fish! Teens spend hours on the phone at a time and can often push limits with their parents when it comes to using those phones. Our cell phone usage contract will aid parents in establishing firm limits with regards to cell phone usage while also addressing proper cell phone etiquette. Our cell phone usage contract covers such topics as: appropriate vs. inappropriate times to use the phone, etiquette, texting, bullying, and more. Character Traits, School and Academics, Attitude and Appearance, Dating and Socializing, Household Rules and Expectations, and General Behavior. So sit back and relax...we've already done all the work! To purchase ALL of 10 of these teen behavior contracts PLUS the teen discipline program PLUS our set of unique parenting tools for parents of teens click here or on the button below! Better behavior is only a signature away!